The Odin crew of Paul Birardi, Eddy Chai, Larry Paul or Kelly Kovack has made the jump into home fragrances. This inaugural collection of scented candles matches their unisex fragrances of 01 Sunda, 02 Owari, 03 Century, and 04 Petrana. In stores now, each candle is beautifully housed in translucent black glass and is accompanied by a black metal lid that doubles as its resting place. This packaging concept matches the overall minimalistic design influences of the fragrance collection and I couldn’t be happier they stuck with it. Upon opening the sample I received, I was awed by its simple beauty. It fits into that category of little home details that reflect the owner’s personality and taste level. As for its scent, it fills a room lit or resting. For sixty hours of burning time, each 8 oz. candle is $65 and is available at Odin New York and Pas de Deux in New York as well as select stores domestically and internationally. This entry was posted in News and tagged Home Fragrances, Luxury Candles, Odin Candle Collection, Odin New York, scented candles. Bookmark the permalink. Oh boy. There goes more of my money. Bye bye, cash! 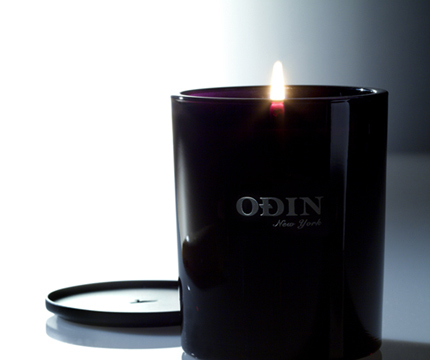 I’m thrilled with all of the Odin blends and have always thought they would make great home fragrances. Have you burned one before, Barney? I wonder how the quality is, and what the composition of the wax is. Carrie, I have burned one and if you like the fragrances, you’ll like the candles. The cedar notes of Sunda really come out as it burns and it fills the room nicely.